Scientists thought that the Tibetan Plateau began to grow when the Indian subcontinent collided with Eurasia 50 million years ago — but other forces outside the collision zone probably helped give the plateau a boost, a new study suggests. How the Tibetan Plateau ascended five kilometers into the atmosphere and became the “Roof of the World” has, for nearly a century, been only partially understood. 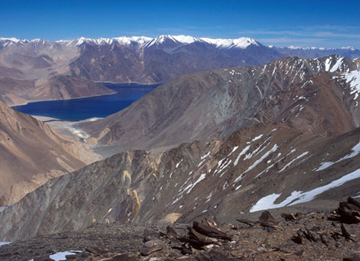 Since the 1920s, scientists have thought that an ongoing collision between India and Eurasia thrust the Tibetan Plateau skyward — but whether that collision alone had the power to raise 3 million square kilometers of Earth’s surface has remained a question. In a paper published this week in Science, geologists Leigh H. Royden, B. Clark Burchfiel and Robert D. van der Hilst of MIT in Cambridge, Mass., hypothesized that other forces could be contributing to its expansive elevation. “The Tibetan Plateau is best viewed in a context broader than the India-Eurasia collision zone,” the team wrote in the paper. Subduction zones to the east of the collision also likely played a part in elevating Tibet, they said. Tens of millions of years before India began to crash into Tibet, Tibet’s crust had already begun to thicken, as a result of tectonic forces related to subduction zones in the ancient Tethys Ocean south of Eurasia. Over time, as the ocean began to close, those subduction zones slowly migrated eastward. When the Indian subcontinent rammed into Eurasia 50 million years ago, the compression from the collision squeezed fragments of the crust beneath Tibet, pushing the fragments from west to east, away from the collision zone toward areas of crustal extension and lower pressure. That flow of crustal material beneath Tibet’s surface is like an “underground river” in which softer earth passes through channels of more solid earth, Royden says. Such flow is possible in the lower crust, she says, because at depth the crust is “several orders of magnitude weaker in viscosity.” The movement of the lower crust continued for 30 million years or so, thickening and elevating the crust in areas outside of the collision zone’s immediate vicinity — such as central Tibet. Then, roughly 20 million years ago, the dynamics changed, the authors reported: The subduction zones ceased their eastward march as the Tethys shrank from an ocean to a sea. The lower crust, as before, flowed eastward beneath Tibet, but unlike before, the subduction zones no longer moved in a way that freed up space for the crustal fragments to disperse beyond the plateau. The result: An enormous volume of crust began to accumulate under eastern Tibet, and the area inflated. This process continues today, the team said, and partly accounts for the eastward expansion of the Tibetan Plateau. The tragic magnitude-7.9 earthquake that shook China on May 12, 2008, offers an opportunity to better understand these processes, Royden says. “After you have an earthquake, the stresses get redistributed,” she says — so, ongoing monitoring of crustal movement related to the earthquake will provide a whole new set of data to understand the forces working beneath eastern Tibet.